Welcome to our gallery of blue and white kitchens. 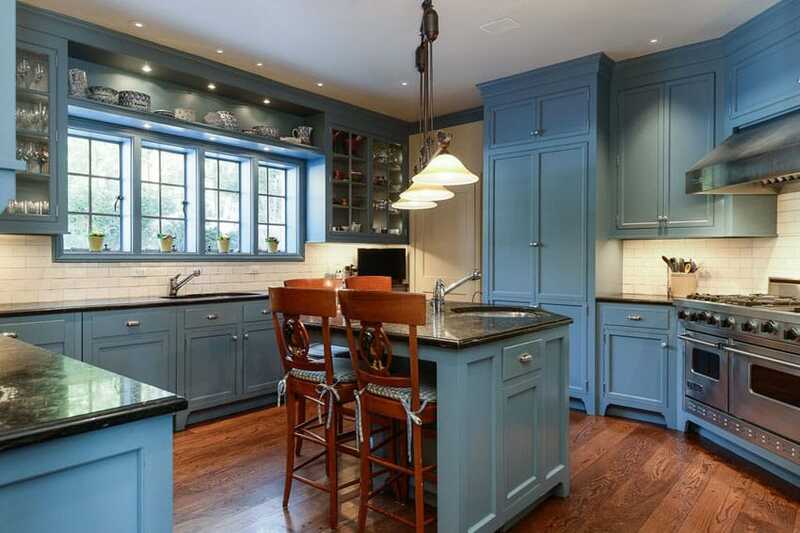 The color blue is commonly used in kitchens as an accent color, on a backsplash or painted on the island. 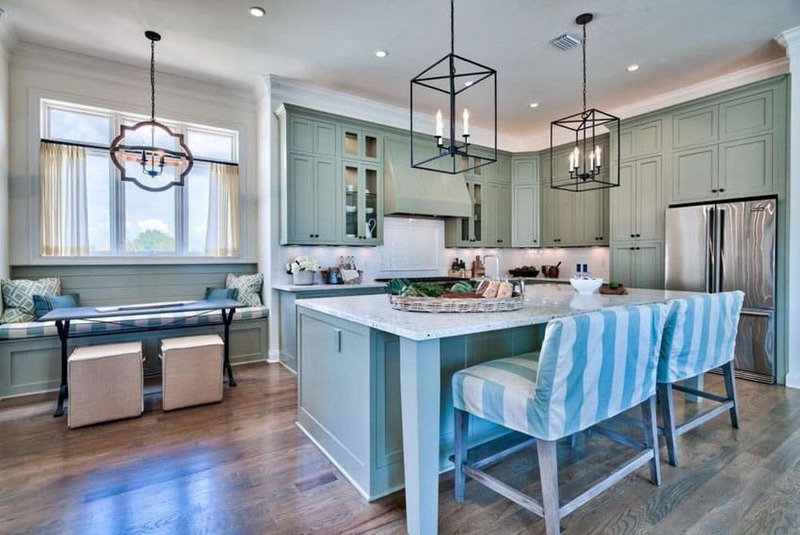 Whether you want to add a pop of color by changing the decor, or go full out and embrace the color with blue cabinets, there are pictures of kitchen designs to help find the style right for you. 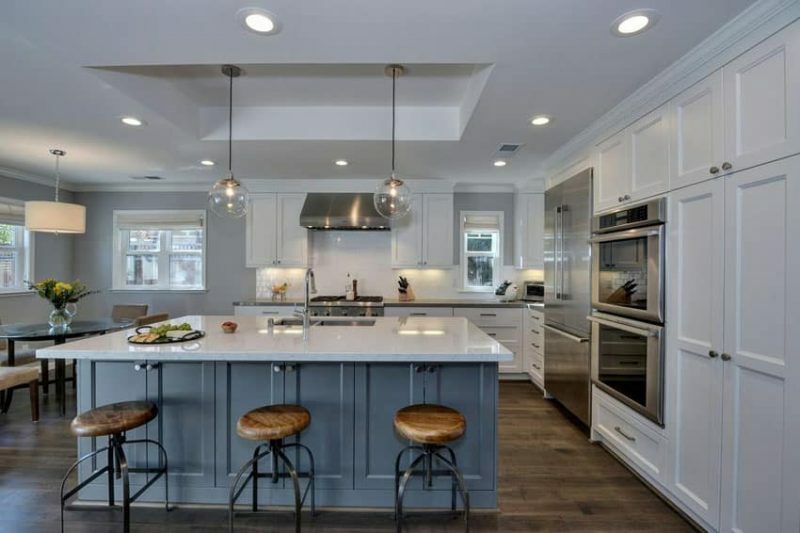 In the photo above is a gorgeous transitional style kitchen featuring all-white main kitchen cabinets with gray solid surface counter and white subway tile backsplash, and a massive kitchen island with a steel blue paneled cabinet base with white marble countertop. These are paired with industrial style bar stools and simple blown glass pendant lamps to complete that vintage Scandinavian look. A blue and white color palette is a classic combination that can be used in many ways to enhance a kitchen. Blue and white can be paired with practically any style of kitchen or decor. From Traditional, French, country, old world, coastal, or farmhouse style kitchens, a blue and white color theme looks beautiful. Breathe new life into your kitchen by adding a pop of color into your classic paneled cabinets. 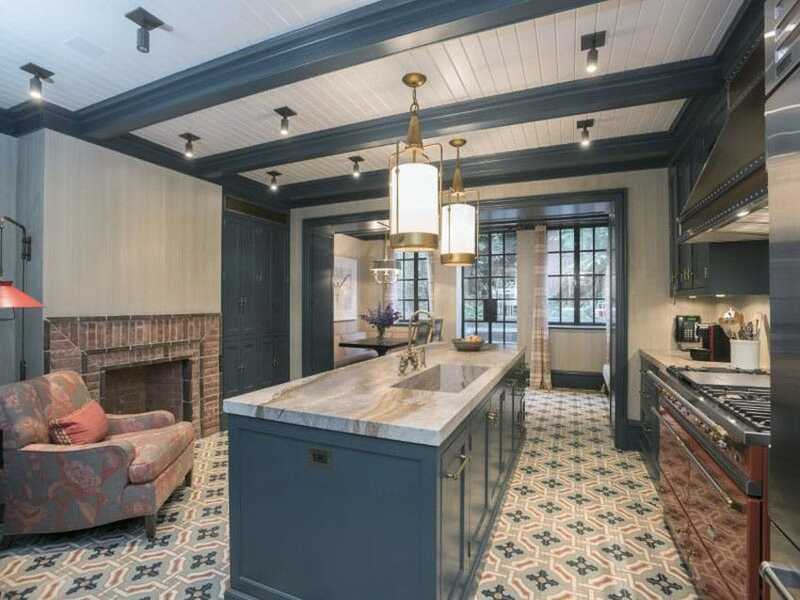 This particular example features a French provincial style kitchen with dark wood flooring and mosaic tile details. 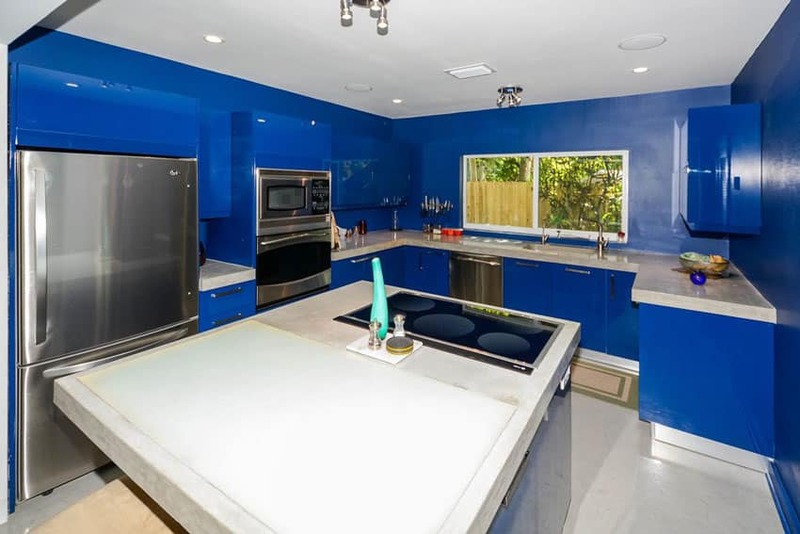 To give it an update, the cabinets were repainted in white, while the large kitchen island counter was painted in brilliant blue, giving it a refreshing new look, which perfectly matches the marble countertop and the stainless steel lamps. Going for a cool and soft feel, this kitchen paints the base of the two kitchen islands in a unique summer blue shade, adding a subtle cool tone to the space, which also matches the undertone of the slate tiles used on the backsplash. The cool blue color creates a nice contrast against the teak wood flooring and the warm white walls and main cabinets. This small kitchen has a clean and fresh look, which gives spring-like relaxing vibe. The classic paneled kitchen cabinets are given a new look by painting it with a matte blue grass color, giving it a slightly minty green tone. The color complements the white marble countertop well, as well as the rustic oak floors and black wrought iron pieces. This contemporary kitchen design gives the space a more unique look and feel by adding rustic finishes and elements into the space. 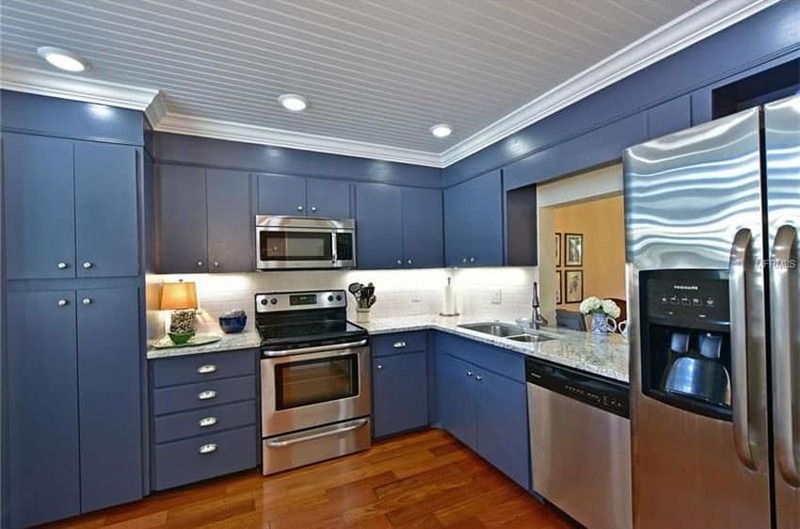 Paneled cabinets were painted in a unique Turkish blue shade, giving it a slightly grayish undertone, which helps it match with the other finishes better. The counters and backsplash uses white soapstone with a gorgeous black grain pattern, while the flooring features weathered walnut planks. 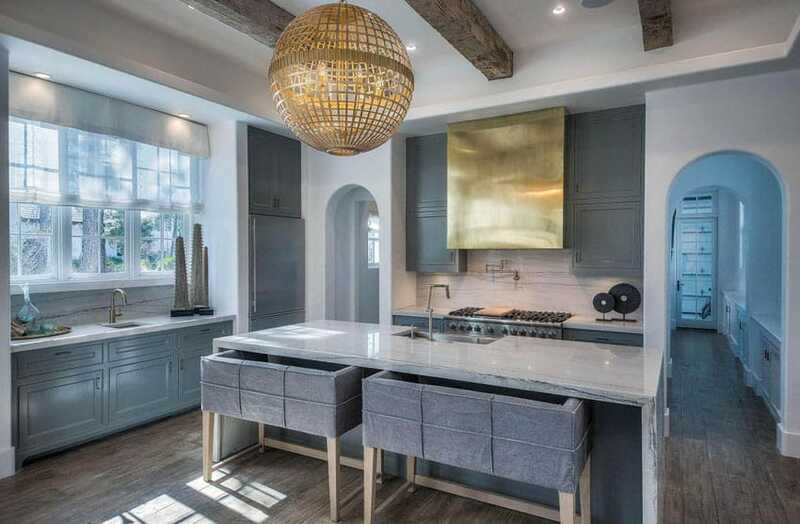 The gold custom range hood cover adds a scene-stealing element into the space, which also gives a nice pop of shine and color to the more muted general color palette of the space. This charming classic white kitchen is given a refreshing boost, by throwing in a refreshing cornflower blue paint on some of the cabinets. The addition of blue into the spaces adds a cool, refreshing touch, as the rest of the kitchen keeps an all -white color scheme. 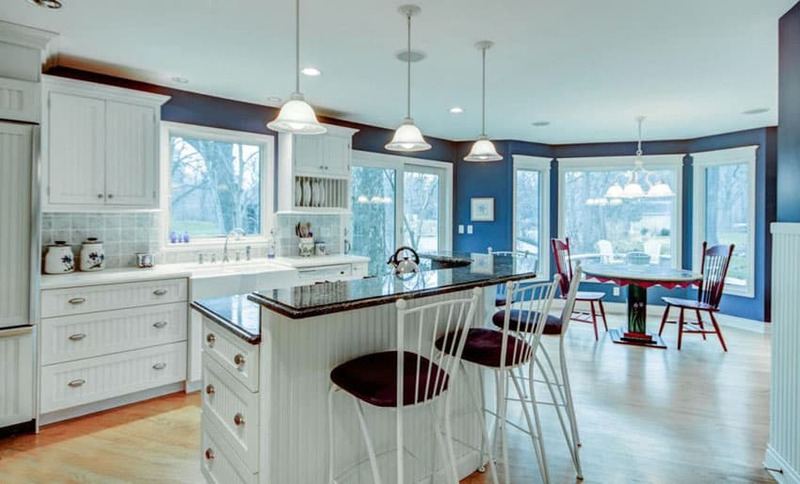 This paint was applied on the base cabinets of the kitchen island and on the large pantry cabinet at the end of the kitchen, so that the blue does not overpower the other elements of the kitchen too much. High ceiling and an open layout helps make this little kitchen feel more spacious. The kitchen area uses a refreshing duck egg paint color on the walls, adding a cool fresh tone to the space which contrasts nicely with the warm-colors stone tiles and mosaic used on the floors and backsplash. While the main kitchen cabinets are white and topped with black granite, the narrow kitchen island paints its base cabinet with unique Mariana blue shade and paired with a thick slab of solid teak wood, adding a rustic element to the classic space. As this kitchen goes for a more transitional contemporary style, the color scheme used is a bit more bold than typical kitchens, using dark-colored kitchen cabinets paired with gray backsplash and light maple floor tiles. The kitchen cabinets are all finished in Tahoe by Kelly Moore, and was paired with plain white solid surface to allow a nice transition between the cabinet and the dark gray backsplash tiles. This gorgeous retro style kitchen is placed in the middle of an open layout, making it directly accessible from the other parts of the house. 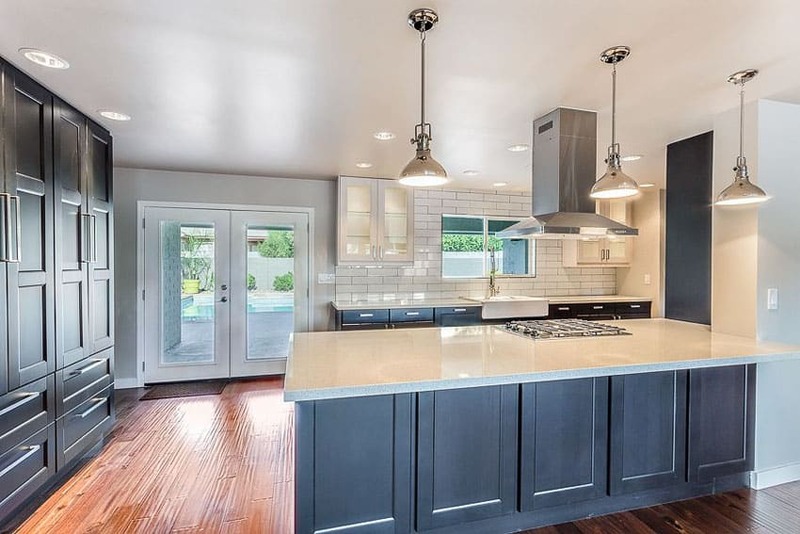 Since the interior wall are painted in a light gray color, the main kitchen cabinets uses white paint finish and uses black soapstone for the countertop to add a little contrast. 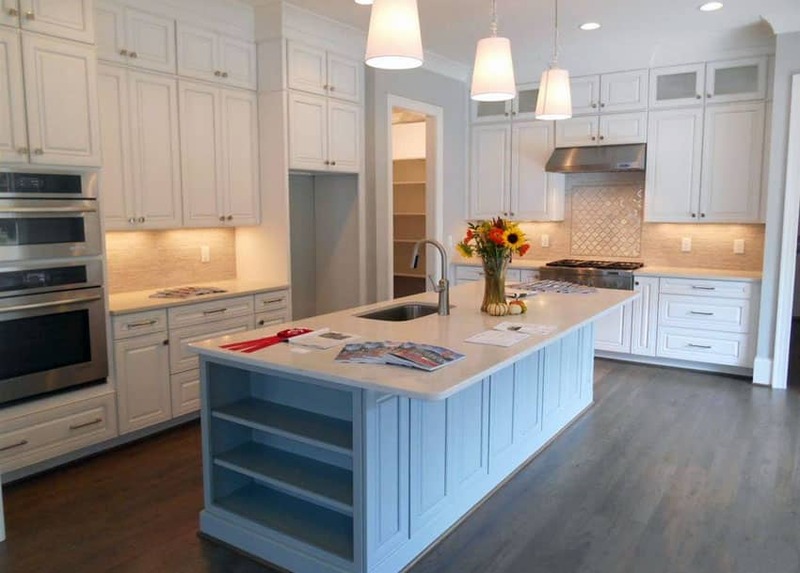 The kitchen island bar bar counter, however, paints its base with a pale blue color, and uses white solid surface for the countertop for a seamless counter. This kitchen has a unique modern appeal with a touch of rustic elements, especially on some of the finishes and textures. The kitchen cabinets are all painted in a dark Mariana blue shade which is almost similar to gunmetal gray. This looks really nice place against the white walls and the Fruitwood flooring. Another unique element of this kitchen would be its kitchen island, which almost looks like a massive dining table with a cabinet base. The kitchen island uses golden walnut for its countertop and provides overhang on all three sides, making it functional as a dining table as well. This classic French style kitchen gives keeps its rustic charm, maintaining a coordinated look for the whole kitchen and the dining area. 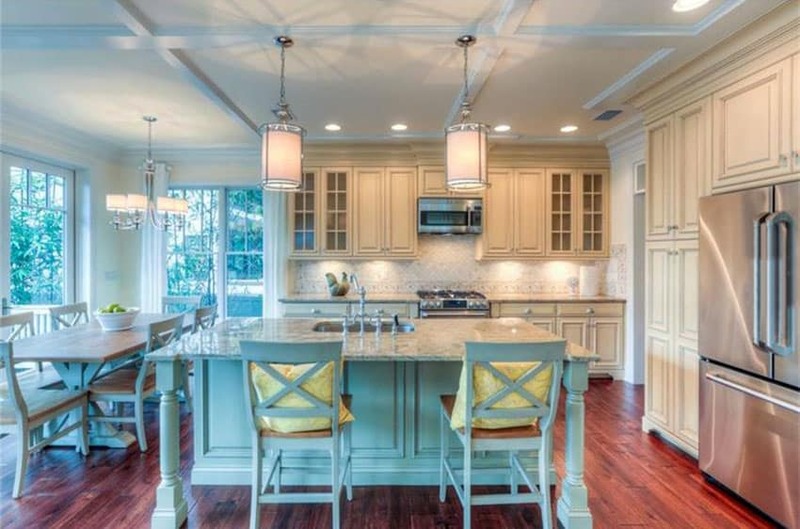 Furniture pieces and finishes are matched in the two area – cabinets and wood pieces are finished with yellow/cream paint, while counter top is white granite. Adding a bit more texture is the natural wood finish of the chair seats and table top, as well as the vibrant red of the cherry wood flooring. This kitchen is a gorgeous modern adaptation of classic kitchen style, given a more retro vintage vibe with its combination of colors and finishes. The floors of the whole area already makes quite a statement, using Moroccan hand-painted tiles, creating a gorgeous pattern on the floor surface. Wood finishes in this area are all matched – everything were painted in a mariana blue shade, including the ceiling mouldings. Metal elements uses a brushed fold finish, adding a touch of warmth and a unique texture to the space. 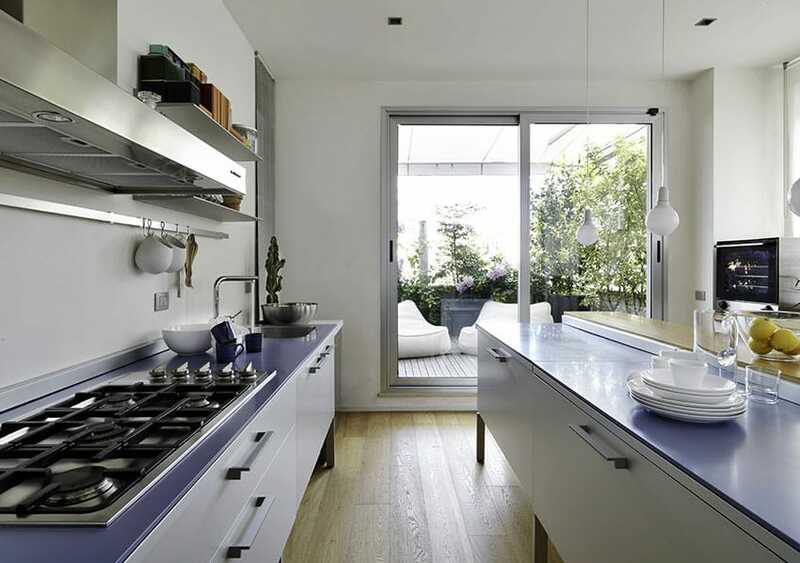 Blue and white kitchens are often chosen due to the calming sensation attributed to the two colors. This modern retro-inspired kitchen features simple plain blue cabinets paired with brushed stainless steel pulls. 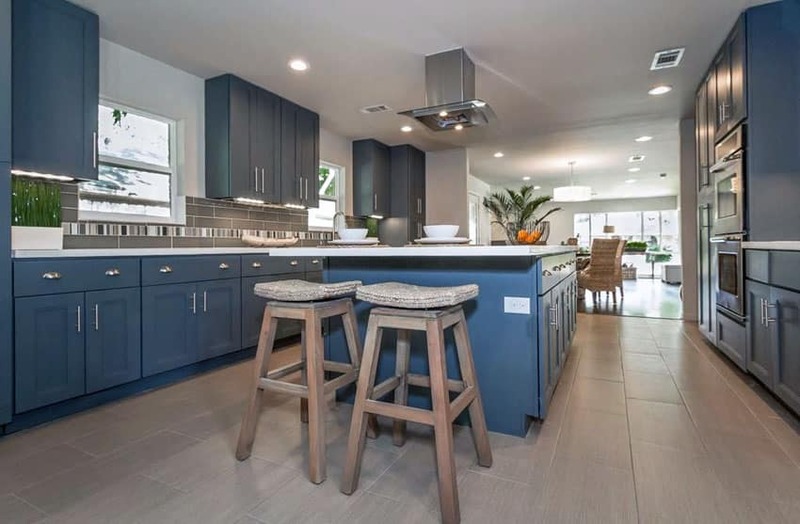 The cabinets are all painted in a matte steel blue color, which contrasts well with the white tile backsplash and warm color of the solid teak wood flooring. 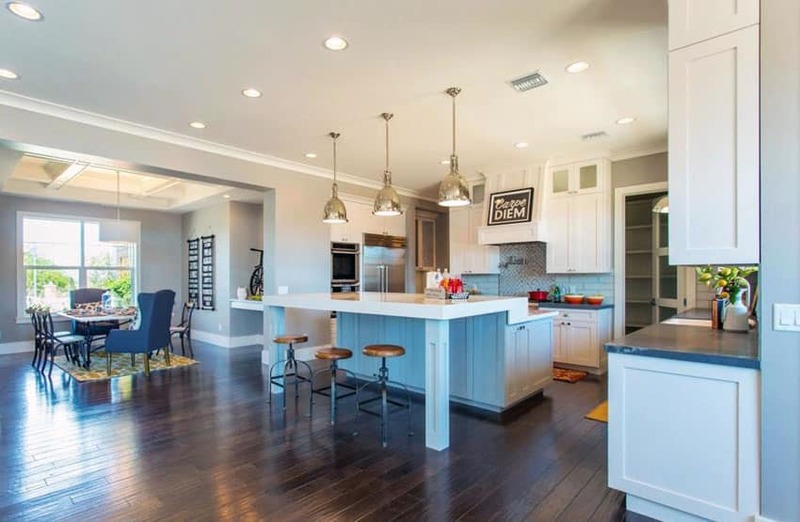 This modern transitional style kitchen looks bright and spacious, thanks to its layout. This kitchen design minimized the use of overhead cabinets in its design, keeping the ceiling and walls a little less busy. The result is a spacious-looking kitchen which has a timelessly elegant appeal. 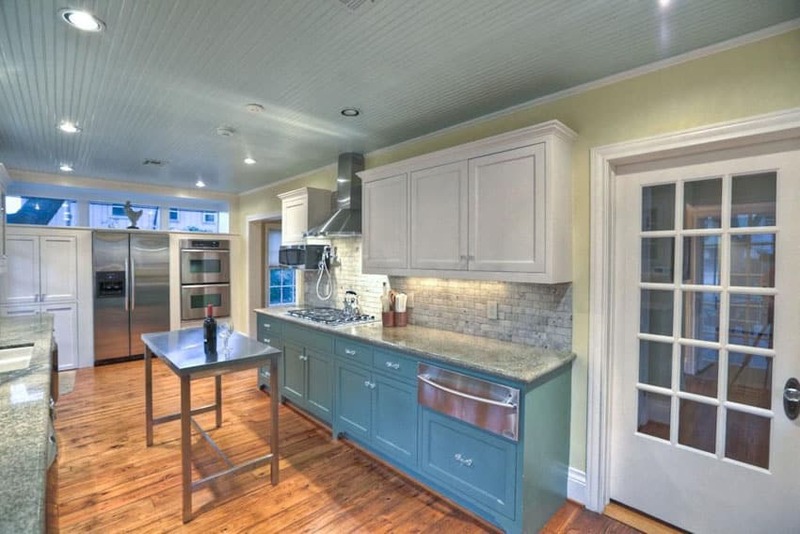 Kitchen cabinets are painted in dark steel blue, while the two small overhead cabinets are painted in white to blend into the white subway tiles on the walls. This modern kitchen design definitely does not shy away from using bold and bright colors. 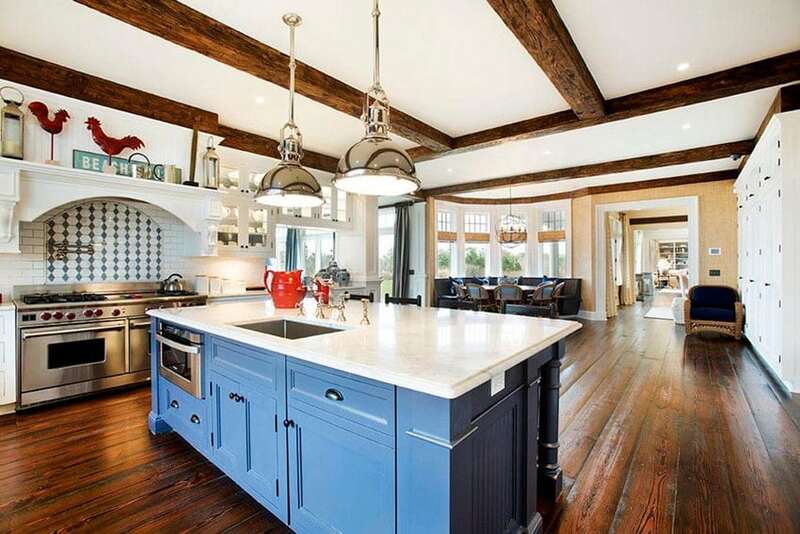 The kitchen is a definite stand-out among all the other areas of the house, as almost everything in the kitchen has a bright cobalt blue finish. Cobalt blue walls, doors, baseboard and even glossy laminates. White porcelain tiles for the floors and white solid surface helps balance the vibrancy of the colors, adding a bit of contrast to help you identify different surfaces. Another vantage point of the modern kitchen shown above. 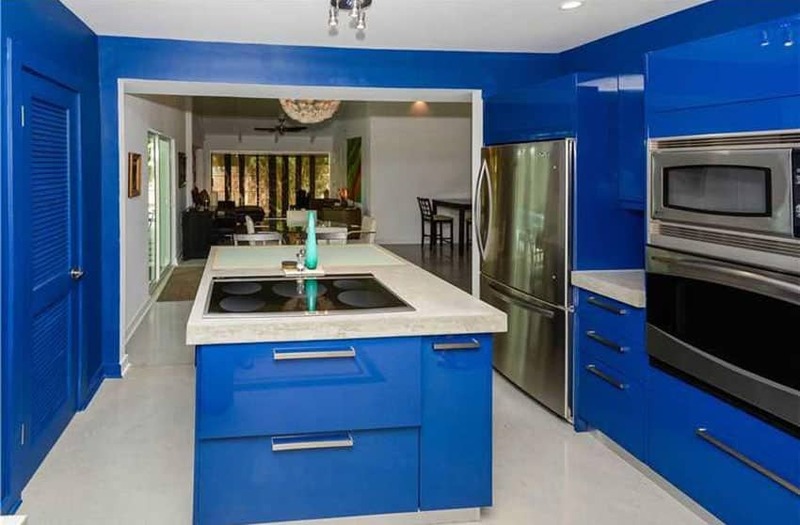 Blue and white kitchen designs that use bold colors such as this one do not always appeal to every home buyer. Bringing more neutral tones to the space by repainting the walls a softer color could help balance the sensory overload of this blue themed kitchen. 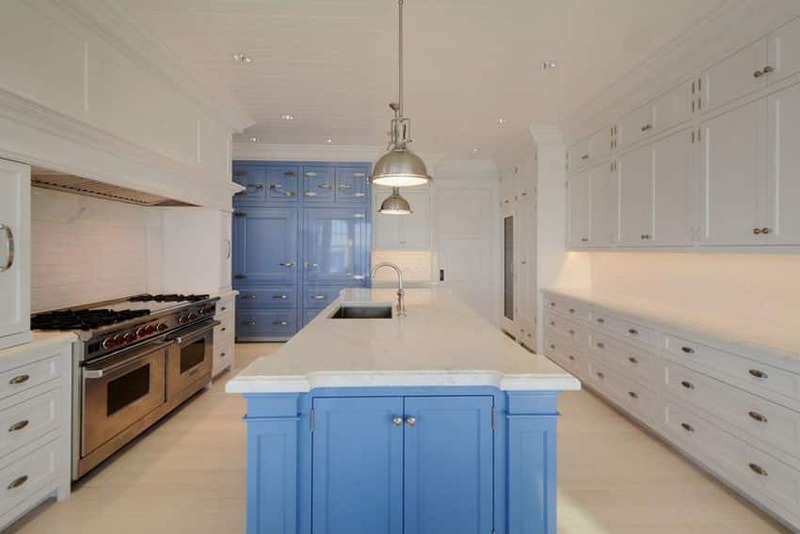 While most other examples combines blue cabinets with white cabinets, this French provincial classic takes a different approach in introducing blue into the kitchen design. 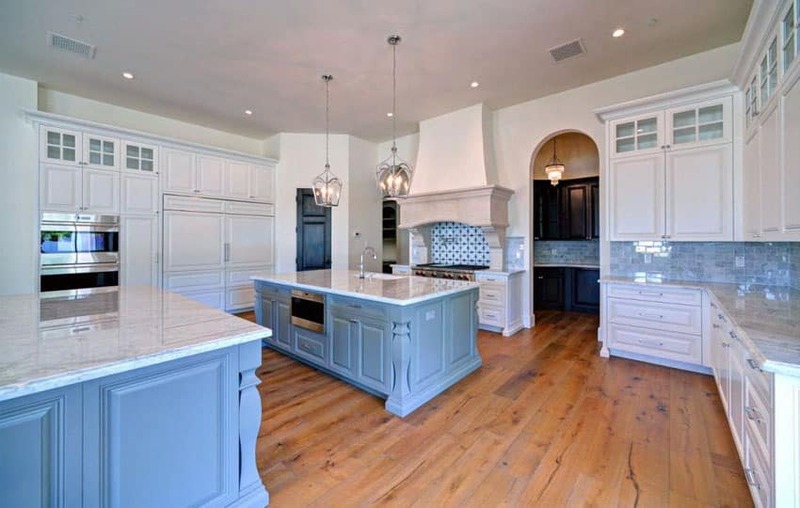 The cabinets all maintain its original all-white paint finish, but the gorgeous Turkish blue color is applied on the walls, making the cabinets and the interior moldings pop-out well. This simple retro kitchen design adds a bit of quirkiness by applying a refreshing duck egg color to one of the base cabinets. The rest of the cabinets all have a plain white finish, so the unique color definitely makes it stand out and makes the whole look of the kitchen more interesting. An easy way to change the look of your kitchen without spending too much is by changing the paint color. This especially works well on kitchens with white cabinets, which makes it easy to pair it with virtually any paint color of you choice. This kitchen is a good example of such, as all its cabinets are white and it uses a simple black granite for its counters. The walls were painted in a light blue color, adding a refreshing cool tone to balance out the strong orange tones from the teak wood flooring. This transitional style kitchen goes for a very light color scheme, combining all-white paneled cabinets with light sage green wall paint colors. 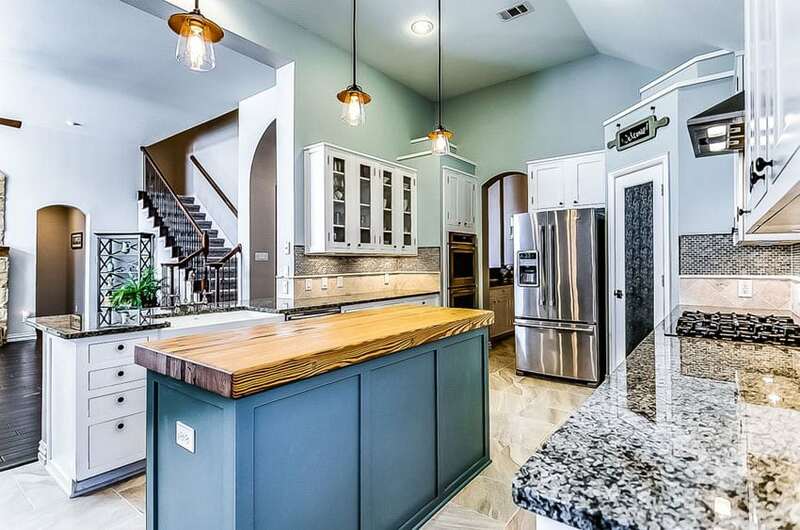 The subtle color of the walls is a nice contrast against the warm rustic oak floors, and helps the white kitchen cabinets stand out more as well. Blue and white kitchens often opt for a painted blue island to bring in a pop of the color without overdoing it. This gorgeous modern kitchen design is an excellent model for fans of modern kitchens. It features modular kitchen laminates with white laminated drawers placed against plain white walls and solid pine flooring. The unique element of this kitchen would be its blue solid-surface counters, which is a unique touch, and gives a subtle pop of color to the space. 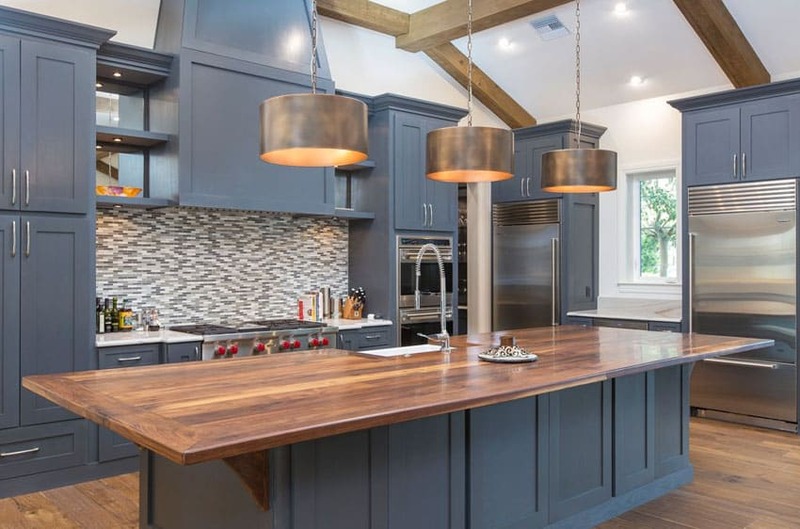 This blue grass shade of paint used on the cabinets gives a vintage feel to this kitchen space and is an excellent complement to the warm-toned wood elements such as the mahogany floors and the cherry wood bar stools. Black granite was used on the countertop, while the backsplash uses white subway tiles. This small kitchen uses very unique vintage-inspired appliances, which definitely steals the scene in this kitchen. 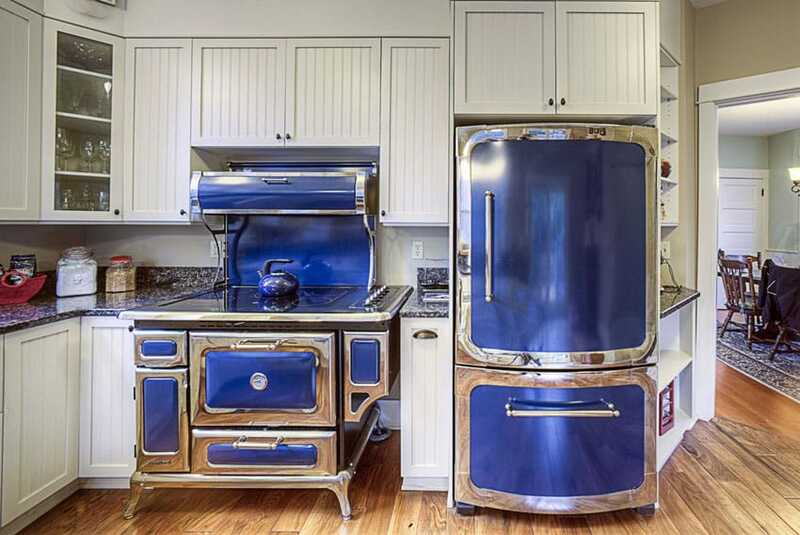 The main cabinets are simply white paneled cabinets with vertical wood slats, but the star of this kitchen would be the matching vintage kitchen stove and refrigerator which has silver chrome and blue chrome finish. 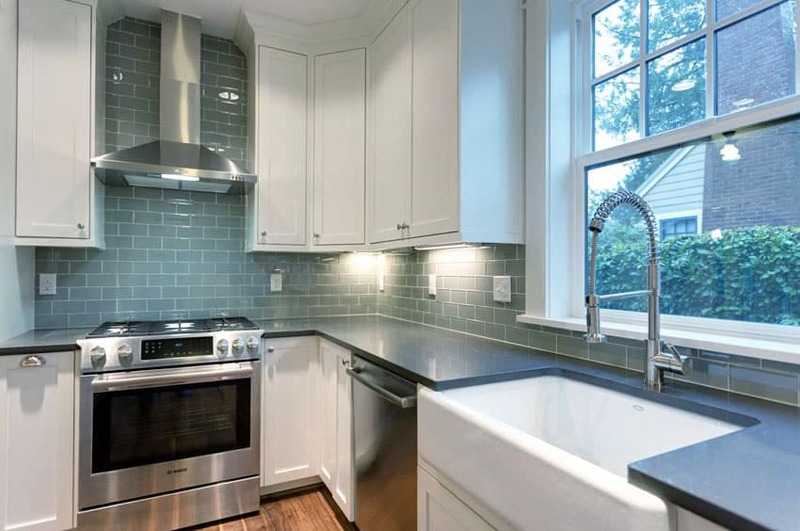 Adding these ashy blue glass subway tiles on the backsplash of this small modern kitchen helps add texture to the surface, as well as add a cool, calming color to the area. The cool tone of the tiles helps give this simple white kitchen a more refreshing look. Dark concerto quartz countertops provide contrast against the cabinetry. 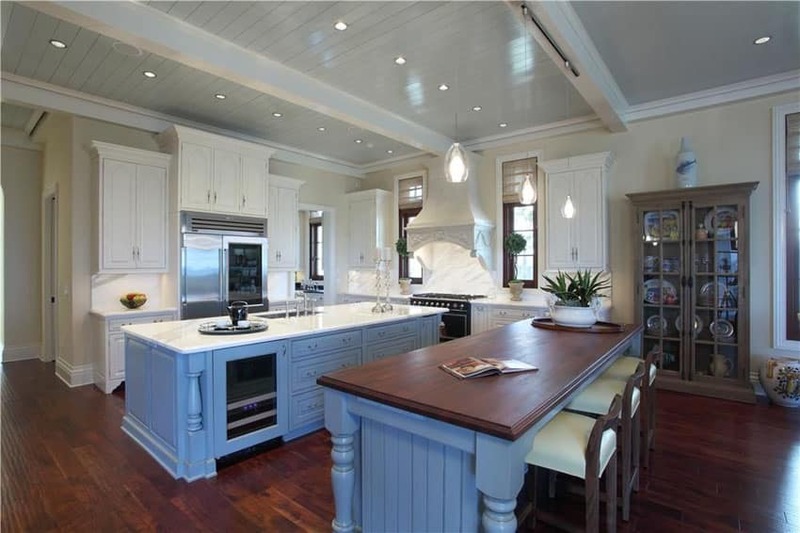 Blue and white kitchens in the traditional French style look elegant and appealing. This is a classic French-inspired kitchen design which uses white paneled cabinets and white marble countertop and backsplash to create that classic elegant look of French kitchens. 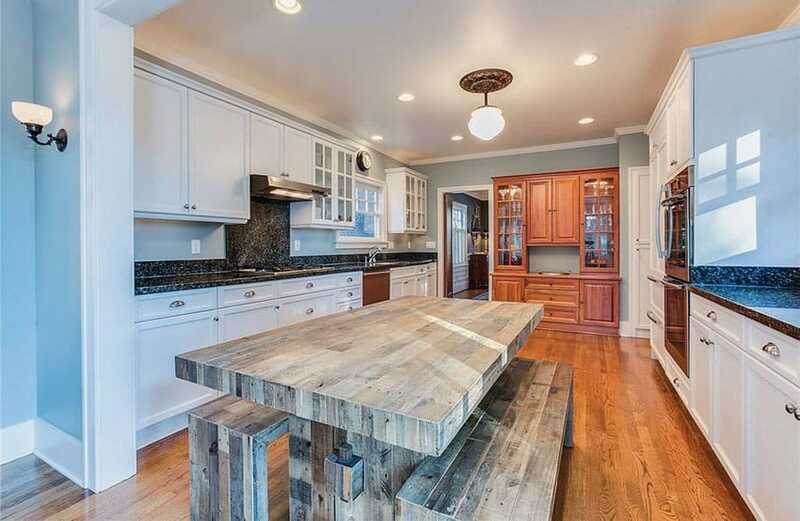 This example has two kitchen islands, one of which is used mainly for dining. These kitchen islands is given a more modern look by painting its base with slate blue, giving it a fresh feel.